Green infrastructure is, by no means the complete solution to the area's complex flooding challenges, but it is an important piece to developing a more resilient strategy overall. Furthermore, green infrastructure is not only an effective technique in capturing water, it is also a vital tool in protecting the health of the water and the important natural habitat of Jamaica Bay. As more cities try to increase the amount of green infrastructure, it's becoming clear that private property owners are key to reaching their goals. 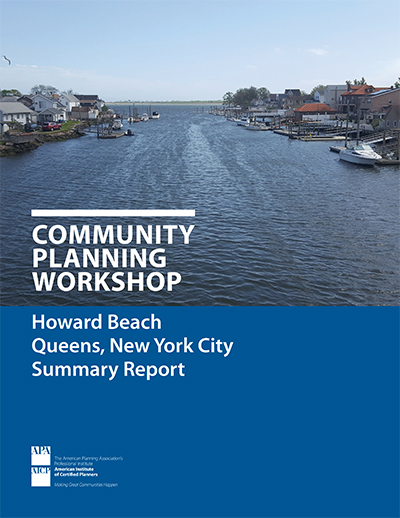 The 2017 Community Planning Workshop took planners to Howard Beach in Queens. The storm surge of Hurricane Sandy caused flood damage to nearly every home in this low-lying neighborhood and cut power to the area for over three weeks. Recovery has been successful in many ways, but that effort continues, as well as taking measures to increase resiliency for future events. The goal of increased resiliency amid the rebuilding efforts will need to include a range of strategies and techniques. The 2017 workshop focused primarily on green infrastructure on private property. The workshop organized a group of volunteer planners from around the country to learn from the Howard Beach experience and to offer an outside perspective of the community's ongoing efforts. The joint group raised important questions, generated many ideas, and highlighted challenges that should help clarify where more work is needed and cultivate new ideas to explore and work toward.